Have you ever wondered how to layer your necklaces? Are you afraid you can't pull it off? Or that you'll break some fashion rules? I think with fashion, if you like it, wear it!! It's fun to play around with trends and think a little outside the box, like mixing prints. Here are some ways you can layer your necklaces. 1. Like I did in this post, you can mix 3 necklaces of different lengths. I paired a short, medium and long length necklace. By making sure there is some open space between the necklaces, it helps each necklace stand out. But the overall look is large and dramatic. They are in the same color family and really pop against the solid color dress. I like having 1 necklace be a larger statement piece. 2. You can also mix a fabric necklace (here) with a gold sparkly tassel necklace (here). The 2 different textures add interest to the combo. 3. Three small delicate necklaces layered at slightly different lengths always pair well together. Most necklaces have adjustable length chains. 4. There are a few different ways to layer with your favorite statement necklace. Add a small pendant (here) or a monogram (here) or a longer simple pendant (here). 5. I have this twisted pearl multi strand necklace that I love. I think it looks great paired with my monogrammed necklace or a longer gold tassel chain (here - love!). 6. I love the look of a stone cluster necklace (here) paired with a thick gold chain necklace (here). It's like making your own statement piece. 7. And of course I love mixing different metals. It can give an unusual but stylish look. Mixing necklaces is a great way to get more wear out of them and really create unique looks to your outfits. Try it and don't worry about the so called "fashion rules". If you wear it with confidence, anything looks fabulous. This adorable cold shoulder dress from Beyond Rubies is perfect for the summer. It's lightweight, super soft and comes in this blue, grey, black, coral and mint. I can't wait to wear it with my white converse for a chic casual look. I think it also would look adorable with flip flops and a crossbody. I am 5'4" so this tunic/dress fits me fine as a dress, but if you are much taller, you'd probably need to wear this as a tunic. These are great tips! I love your choice of necklaces! What a cute dress! I love the open shoulder and your layered necklaces! Great ideas to accessorize! I really like the tip to mix a gold tassel necklace with a fabric necklace. Also, love that cold shoulder dress on you! Great tips, Love how you layered these pieces for a fun look. For some reason it's never occurred to me to pair a small, delicate necklace with a statement piece but you styled it fabulously! I'm definitely going to have to save these tips and try them out. Thanks! I haven't paired a delicate necklace with a statement necklace before, but I definitely need to! I mainly have just statement necklaces! Love this dress too! Great tips! Layering necklaces can be so tough! You did such a nice job layering these statement necklaces. 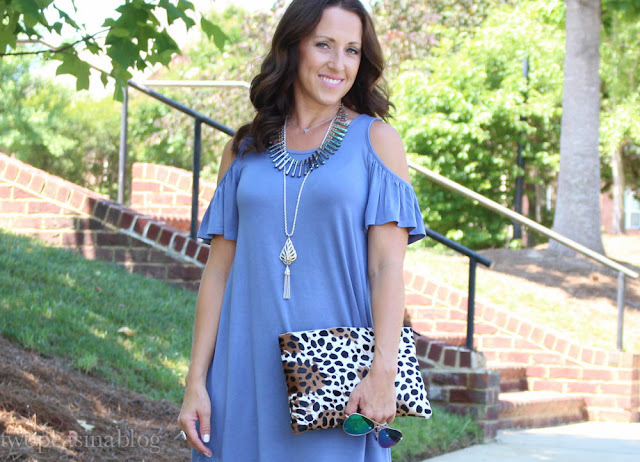 I love your cold-shoulder dress, too! Oh wow, I needed these tips! I will give them a try one of these days. Looking fab as always - love the dress! ahh you're so good at it. I have only been able to do a long statement necklace with a small one. I love that clare V too! Layering necklaces is definitely my new favorite thing! It makes jewelry possibilities endless! 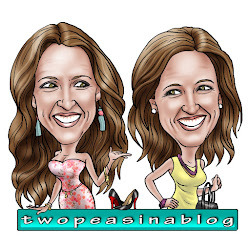 And I never thought to do it before blogging! Great tips! I always do #3 & #4, especially a bunch of dainty ones. But I do need to branch out and try some other ways! Thanks for sharing! 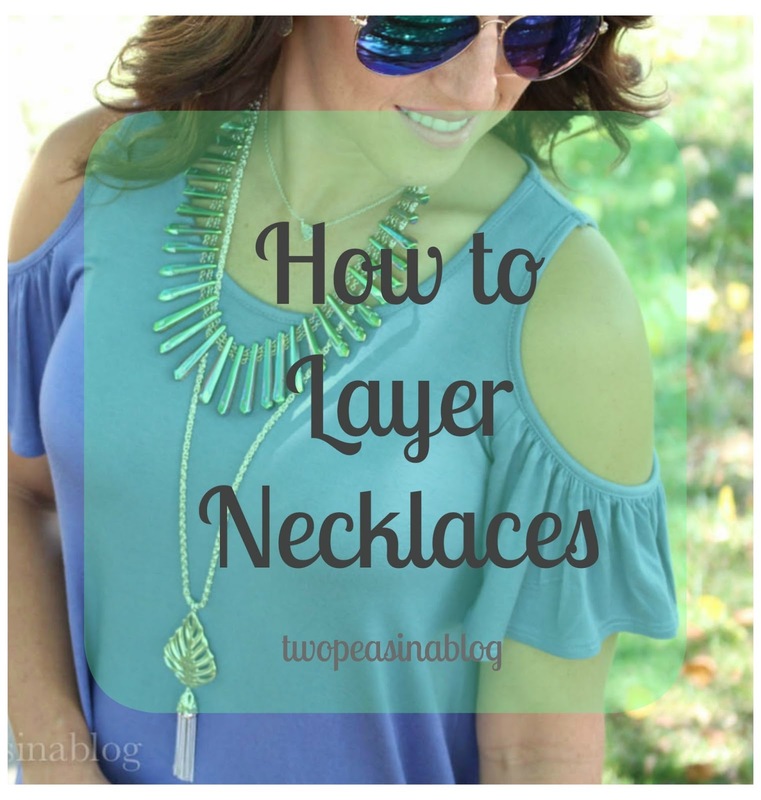 Such a cute look and GREAT tips for layering necklaces…you've layered perfectly! 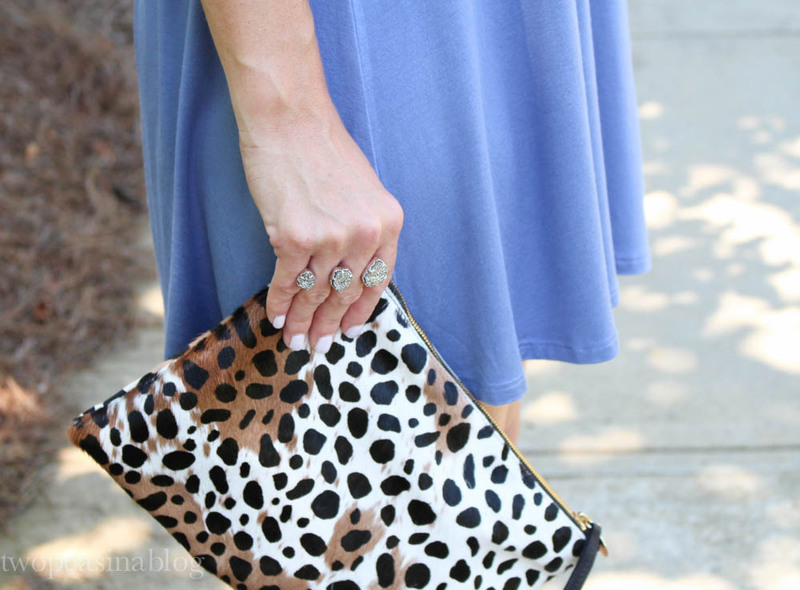 Obsessing over that ring and clutch too! I love this look and your tips for layering necklaces. I think no. 7 is my favorite. I LOVE mixing metals and do it on the daily, but I should start experimenting more with layering necklaces of mixed metals. Also, you and I were on the same wavelength yesterday with the "wear what you like" advice. Great post, lady! I think i'm going to need that necklace from Kendra Scott! You look amazing it that color it just pops!! Looks so easy to wear which is a must with me. Okay, I absolutely love this post! Just like you said, I never want to break any fashion rules, but at the same time there aren't any. Do what you want and what you think looks best. You have styled this so cute! I absolutely love layered necklaces, so trendy right now! Love your dress and how you styled this whole look! Love these tips, I never really layer mine. I love the clutch that you're holding! What good tips!! I'm not much of a necklace layer-er since I never really knew if it looked good or not unless I asked a roommate or something! So I appreciate the tips!! Love the cold shoulder dress. I'm all about them right now! !